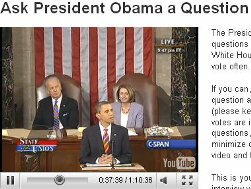 President Barack Obama has created a custom channel on YouTube where you can watch the full State of the Union Address. Even better, you can submit questions directly to him (President Obama) and he will be answering in a live YouTube interview at the White House next week. The preference for submitting question is by submitting a video of yourself asking the question. There are already 9,355 questions submitted from 40,755 people. From the YouTube Channel, “The President will respond to a collection of your questions in a live YouTube interview at the White House NEXT WEEK. Submit now, and vote often. If you can, shoot a video of yourself asking the question and attach it to your submission (please keep it under 20 seconds). After your votes are in, we’ll collect a shortlist of the top questions, ensuring we cover a range of issues, minimize duplicate questions, and include both video and text submissions. This is your opportunity for an exclusive interview with the President, so be sure to submit great questions and vote for the ones you think should be asked. View a live Twitter stream of discussions about President Barack Obama and The State of the Union Address.